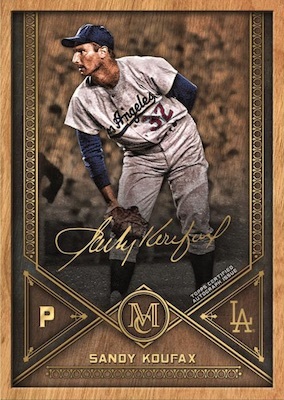 The one-hit-per-pack MLB mainstay carries on in 2019 Topps Museum Collection Baseball. Each box contains two autographs, including one of the on-card variety, and two relics. The MC brand does not change a ton year over year, but the 2019 edition refreshes the look from the 2018 set. 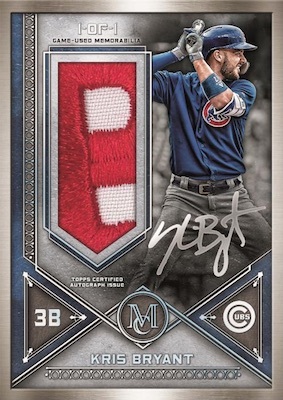 The 2019 Topps Museum Collection Baseball checklist may be mostly about the hits, but it still offers base collectors a little something to work with. The 100-card set sticks with top current stars, rookies and league legends. 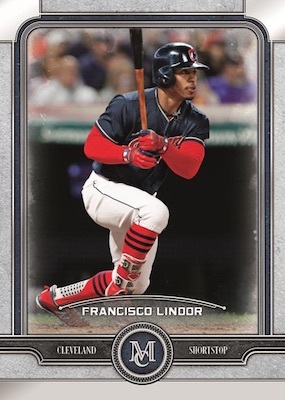 Averaging one per pack, parallels include Copper, Sapphire (#/150), Amethyst (#/99), Ruby (#/50) and Emerald (1/1) versions. The Canvas Collection insert is back in 2019 with Canvas Collection Reprints displaying some quality artwork images. In addition, the one-of-one sketch cards are the real deal, including Canvas Collection Originals, Canvas Collection Original Player Autographs and the new Canvas Collection Originals Shaped Sketch cards utilizing a die-cut design. 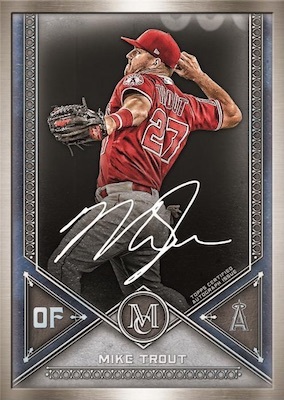 Stressing on-card content, the autograph lineup in 2019 Topps Museum Collection Baseball is pretty strong, and collectors can expect one in every box. Archive Autograph features over 60 past and present names. These are each serial numbered, as are the Copper (#/50 or less), Gold (#/25 or less) and Emerald (1/1) parallels. Falling one per case, the hard-signed Museum Framed Autograph cards are issued in Silver Frame (#/15), Gold Frame (#/10), Black Frame (#/5) and Wood Frame (1/1) editions. The on-card fun doesn't stop there as the multi-signed cards include Dual Autographs (#/15 or less) and Triple Autographs (#/5). Debuting in the 2019 product, Superstar Showcases (#/25) takes an action-image approach for up to 30 subjects. 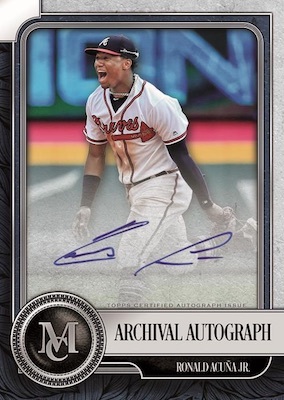 Also found at a rate of one per 2019 Topps Museum Collection Baseball box, the auto relic selection supplies the second autograph. The single-player Signature Swatches line is home to the numbered Dual Relic and Triple Relic styles, as well as Copper (#/50 or less), Gold (#/25 or #/5) and Emerald (1/1) parallels. While most boxes are likely to have a Signature Swatches card, other choices include Momentous Material Jumbo Patch Autographs (#/15 or less) in Gold (#/5) and Emerald (1/1), and new Momentous Material Dual Jumbo Patch Autograph Book cards (#/5 or less). The booklet cards also have a one-of-one Emerald parallel. The hard-signed Museum Framed Autograph Patch cards are a one-of-one chase, as are the new Museum Framed Dual Autograph Patch Book cards with game-worn patches. 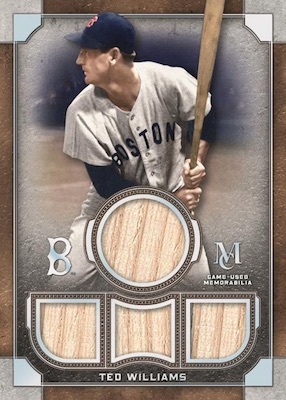 Providing the other half of the hits in 2019 Topps Museum Collection Baseball, collectors can expect one prime relic and one quad relic in every box. Prime relics include Meaningful Material Relic and Dual Meaningful Material Relic cards, each numbered to 50 or less. Parallels bring that down to 35 copies or less. 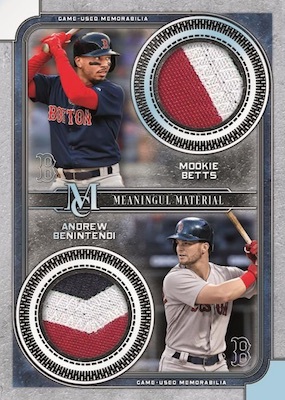 Going bigger, the Momentous Material Jumbo Patch Relic cards are limited to five copies with a one-of-one Emerald edition. Ture one-of-one options consist of Jumbo Lumber Bat Nameplate Relics, Museum Memorabilia MLB Batter Logo and Museum Memorabilia Laundry Tags cards. 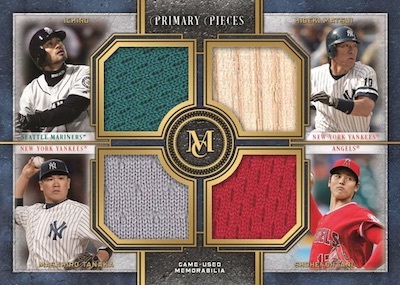 As for the quad relics in 2019 Topps Museum Collection Baseball, these all fall under the Primary Pieces insert. The breakdown offers single-player (#/99 or less), single-player legends (#/25 or less), and four-player (#/99 or less). Both the single-player and four-player versions have Copper (#/75 or less), Gold (#/25) and Emerald (1/1) parallels, while legend cards have only Gold (#/10) and Emerald (1/1).